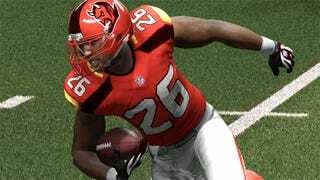 Madden NFL 25 brought back franchise relocation, allowing you to keep a club's name and look in its new city or pick from two or three new nickname and uniform options. And yeah, some of those designs weren't so great. The game's fake Twitter feed would even say so. So EA Sports is looking to the wisdom of the crowd to give renamed and relocated teams more legitimacy in the upcoming game (which I note, has not been numbered yet.) They're open to submissions for redesigned logos and uniforms, and they say they will consider new nicknames for teams and cities where they can be moved, but prefer that you work off the existing list. All of the details for submitting a design can be seen here. You won't be paid, but you will receive a design credit in the game and, of course, a copy of it on your choice of platform. I'm sure EA Sports' designers think of this stuff, too, but licensing partners, I've always said, are the mothers-in-law of video gaming and can unilaterally shoot down anything that makes them uncomfortable. For a non-sports example, see Mortal Kombat vs. DC Universe. So hypothetical NFL team nicknames and designs have to be done in a very controlled environment, if that environment is an NFL video game. Anyway, go for it. And if you want to redesign the Orlando Sentinels' logo, please, please, please make it a newspaper.